GBP/USD retreated from its recent highs during yesterday’s trading, and this may have been a result of profit-taking ahead of today’s major US events. The US Advanced GDP reading is up for release and the economy is expected to have grown by 1.1%, slower than the previous 1.8% expansion. Take note that the Q1 GDP reading was already revised lower from the initial estimate of 2.2%. A weaker than expected reading would therefore be very negative for the dollar as it would remind traders that the economy is still weak and might not survive with less stimulus. GBP/USD seems to be finding support at the 38.2% Fib, which is in line with an area of interest and the 1.5200 major psychological level. 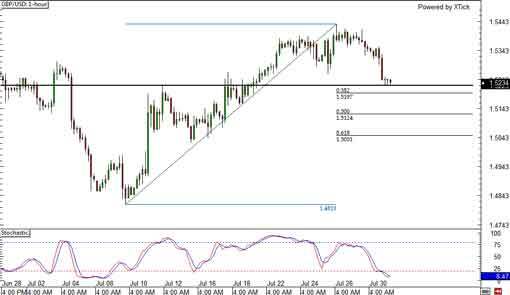 A bounce could take the pair up to its recent highs around 1.5400.